Japan’s H-II Transfer Vehicle-7 (HTV-7) is pictured moments after it was released from the grips of the Canadarm2 robotic arm. Expedition 57 Commander Alexander Gerst of ESA (European Space Agency), with back-up support from NASA astronaut Serena Auñón-Chancellor, used the International Space Station’s Canadarm2 robotic arm to release a Japanese cargo spacecraft at 11:51 a.m. EST. 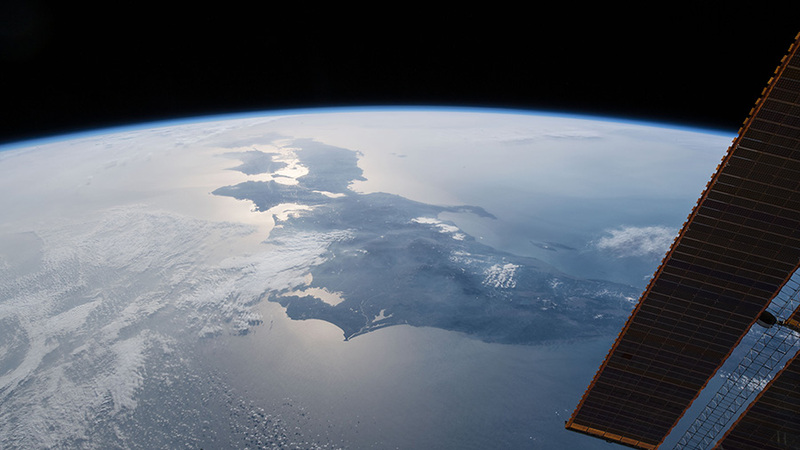 At the time of release, the space station was flying 254 miles over the northern Pacific Ocean. Earlier, ground controllers used the robotic arm to unberth the cargo craft. After release, a new, small reentry capsule will be deployed from the unpiloted H-II Transfer Vehicle-7 (HTV-7) of the Japan Aerospace Exploration Agency (JAXA). Designed by JAXA and assembled by the station crew, the conically shaped capsule measures 2 feet in height and 2.7 feet in width. The project is a technology demonstration designed to test JAXA’s ability to return small payloads from the station for expedited delivery to researchers. HTV-7 will be a safe distance away from the space station after the last of several deorbit maneuvers. The return capsule will be ejected from a hatchway after the deorbit burn. The experimental capsule will perform a parachute-assisted splashdown off the coast of Japan, where a JAXA ship will be standing by for its recovery. The HTV-7 spacecraft is scheduled to re-enter the Earth’s atmosphere and burn up harmlessly over the South Pacific Ocean Nov. 10. This view of Japan from the International Space Station looks from north to south and encompasses the cities of Tokyo, Nagoya, Osaka, Hiroshima and Fukuoka. Japan’s seventh resupply ship to the International Space Station is packed and readied for departure Wednesday morning. However, the Japanese cargo ship, H-II Transfer Vehicle-7 (HTV-7), has one more delivery mission before it burns up safely over the Pacific Ocean. Station skipper Alexander Gerst of ESA (European Space Agency) will command the Canadarm2 robotic arm to release the HTV-7 at 11:50 a.m. EST Wednesday. It will spend about an hour maneuvering safely away from the station on a trajectory to begin its next mission. Flight Engineer Serena Auñón-Chancellor will monitor the vehicle until it reaches a point about 200 meters from the space station. NASA TV begins its live coverage of the departure Wednesday at 11:30 a.m. The HTV-7 will fire its deorbit engines Saturday for a fiery but safe ending to its mission after 41 days attached to the station’s Harmony module. Before the HTV-7 self-destructs in Earth’s atmosphere it will release a small reentry capsule loaded with test cargo for splashdown in the Pacific Ocean near the Japanese islands. The capsule will be retrieved by personnel from the Japan Aerospace Exploration Agency to test the space partner’s ability to safely return precious space cargo for analysis on Earth. As the two Expedition 57 astronauts packed the cargo ship, cosmonaut Sergey Prokopyev continued his space physics research, photo inspections and inventory updates. The cosmonaut explored how microgravity and the Sun impact plasma-dust crystals. Prokopyev also photographed the condition of the station’s Russian segment then updated the station’s inventory system. Flight Engineer Serena Auñón-Chancellor of NASA monitors the arrival of the H-II Transfer Vehicle-7 (HTV-7) before it was captured during Expedition 56 by Commander Drew Feustel operating the Canadarm2 robotic arm. A pair of Expedition 57 astronauts trained for the release of a Japanese resupply ship Wednesday after a 41-day mission at the International Space Station. Japan’s seventh cargo ship, H-II Transfer Vehicle-7 (HTV-7), has one more mission though after it departs the orbital lab. If all goes as planned, astronaut Alexander Gerst of ESA (European Space Agency) will command the Canadarm2 robotic arm to release the HTV-7, also called the Kounotori, Wednesday at 11:50 a.m. EST. Flight Engineer Serena Auñón-Chancellor will back up Gerst in the cupola monitoring the vehicle and its telemetry as it slowly backs away from the space station. 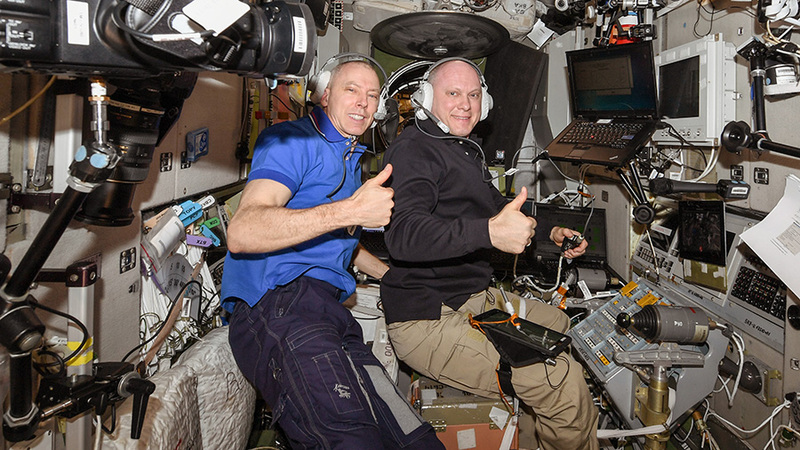 The two astronauts reviewed departure procedures and practiced robotics controls on a computer today. NASA TV will broadcast live the space freighter’s departure beginning at 11:30 a.m.
Kounotori was captured Sept. 27 and delivered external station batteries and hardware to be configured during a pair of upcoming spacewalks. The resupply ship also replenished the station with advanced science experiments and equipment to benefit humans on Earth and in space. However, it has one more payload to deliver for splashdown on Earth before the vehicle burns up harmlessly over the Pacific Ocean. The HTV-7 will release a small reentry capsule packed with test cargo for retrieval by the Japan Aerospace Exploration Agency (JAXA). The splashdown mission is a test of JAXA’s ability to return small payloads from space for quick delivery to researchers on Earth. Cosmonaut Sergey Prokopyev worked on science and maintenance tasks throughout Monday in the orbital lab’s Russian segment. He started out researching how the space environment and solar radiation affects plasma-dust crystals. Prokopyev finished up his day photographing the condition of the Zvezda service module interior panels before disposing of obsolete hardware in the Progress 70 resupply ship. The Soyuz MS-10 spacecraft launched Oct. 11, 2018, with Expedition 57 crew members Nick Hague of NASA and Alexey Ovchinin of Roscosmos. During the Soyuz spacecraft’s climb to orbit, an anomaly occurred, resulting in an abort downrange. The crew was quickly recovered in good condition. Japan also announced today the release of its H-II Transfer Vehicle-7 (HTV-7) resupply ship, also called the Kounotori, from the station’s Harmony module. Commander Alexander Gerst will command the Canadarm2 robotic arm to release Kounotori Nov. 7 at 10:50 a.m. EDT as Flight Engineer Serena Auñón-Chancellor supports him. 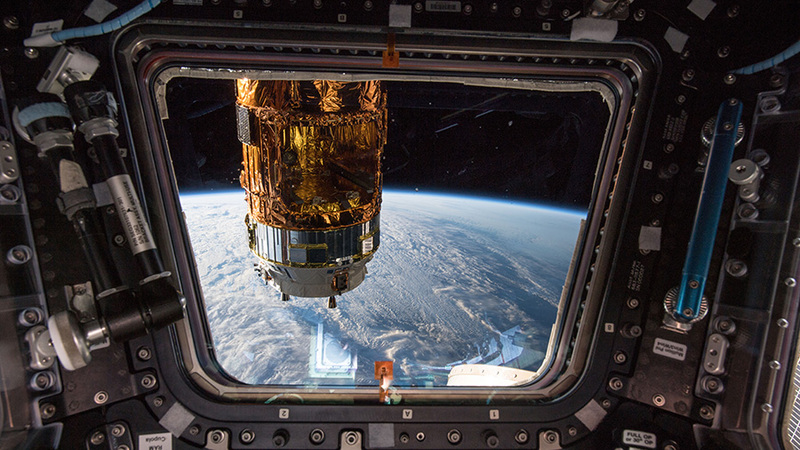 The H-II Transfer Vehicle-7 (HTV-7) from the Japan Aerospace Exploration Agency (JAXA) is viewed from one of seven windows inside the cupola, the International Space Station’s “window to the world.” The orbital complex was flying at an altitude of about 257 miles off the coast of Canada above the Gulf of St. Lawrence. The International Space Station is getting ready for Japanese and U.S. cargo ship operations next month. In the meantime, the three residents onboard the orbital lab today configured science hardware and checked out safety gear. Serena Auñón-Chancellor from NASA worked in the Japanese Kibo laboratory today replacing gear inside a Multi-Purpose Small Payload Rack (MSPR). The MSPR provides a workspace that supplies power and video enabling research into a variety of smaller experiments. She spent the majority of the day working on video cable connections and swapping out a computer in the MSPR. 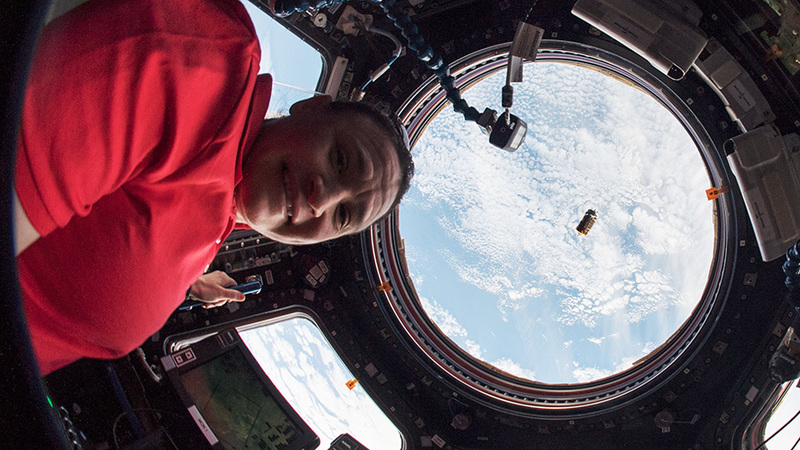 She and Commander Commander Alexander Gerst started Tuesday practicing wearing and using breathing gear connected to an oxygen port in the event of a space emergency. 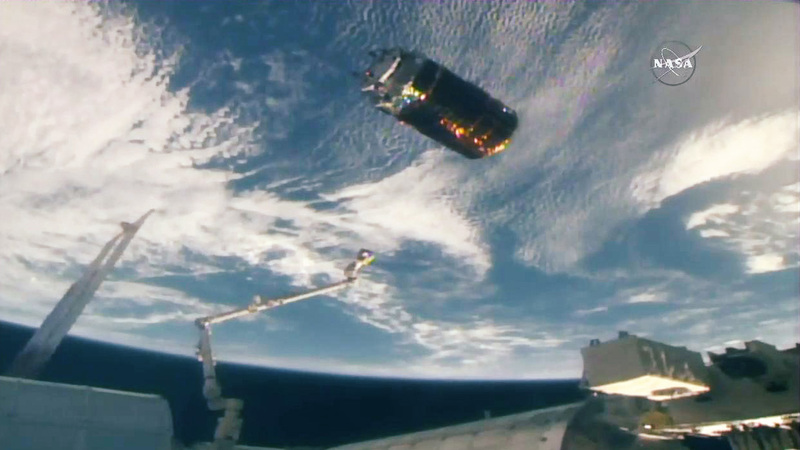 Gerst then helped out with the MSPR work before the duo moved on to packing Japan’s HTV-7 resupply ship. Sergey Prokopyev of Roscosmos worked out on a treadmill today to help Russian scientists understand how the human body is impacted by exercise in microgravity. He then spent the afternoon on computer and life support maintenance. The HTV-7 is being packed before its removal from the Harmony module with the Canadarm2 and released back into Earth. However, the vehicle has one more mission before its fiery destruction over the Pacific Ocean. The HTV-7 will also release a small reentry capsule for recovery in the Pacific Ocean by the Japan Aerospace Exploration Agency. The recovery mission is a test of the Japanese space agency’s ability to retrieve experiment samples safely and quickly from the station. An American cargo ship is due to replenish the Expedition 57 crew a few days after the HTV-7 leaves. Northrup Grumman’s Cygnus space freighter will take a three-day trip in space before it is captured with the Canadarm2 and berthed to the Unity module. Cygnus will stay attached to the station for 86 days of cargo operations. (From left) Expedition 56 Commander Drew Feustel of NASA and Soyuz MS-08 Commander Oleg Artemyev of Roscosmos practice on a computer the Soyuz descent procedures they will use when they return to Earth on Oct. 4. October will be a busy month as a pair of crews get ready to swap places on the International Space Station followed by a pair of spacewalks. Also, Japan’s HTV-7 resupply ship is open for business and the Expedition 56 crew has begun unloading its science and supplies. 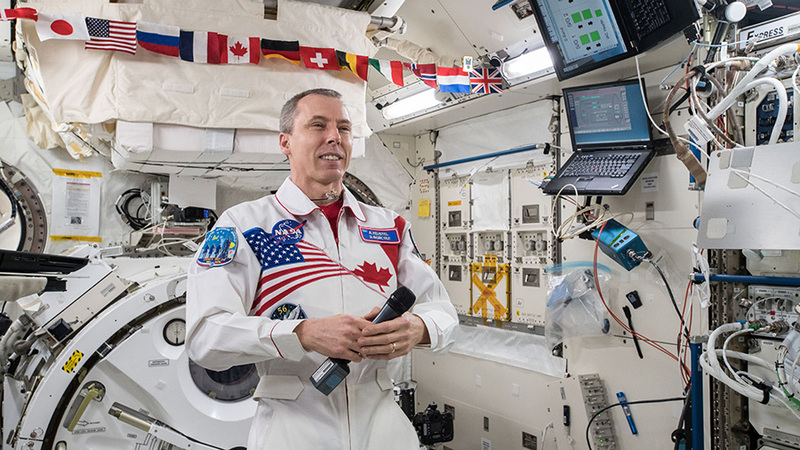 Station commander Drew Feustel is preparing to return to Earth Thursday with two of his crewmates despite a busy schedule of science and maintenance aboard the orbital lab. Cosmonaut Oleg Artemyev is packing the Soyuz MS-08 spacecraft today that he will pilot back to Earth flanked by Feustel and NASA astronaut Ricky Arnold. The trio is due to land in Kazakhstan at 7:45 a.m. after 197 days in space. Expedition 57 starts when the Soyuz MS-08 crew ship undocks Thursday at 3:57 a.m. EDT. Staying behind are Alexander Gerst of ESA (European Space Agency) who will command the station with Flight Engineers Serena Auñón-Chancellor and Sergey Prokopyev until a new pair of crewmates join the following week. 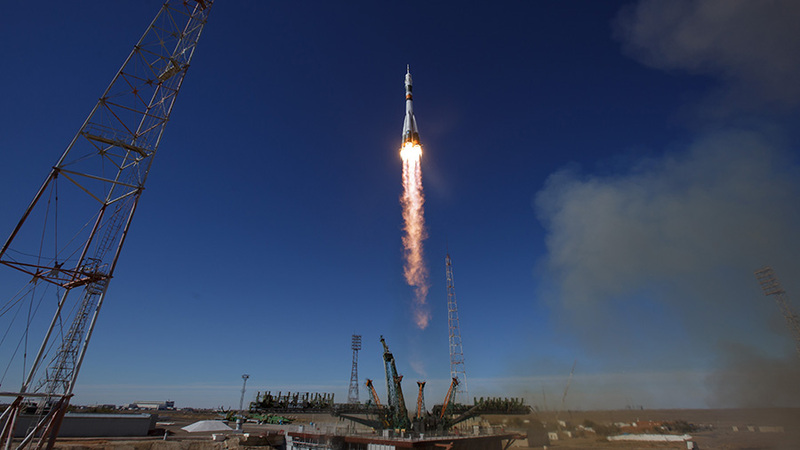 NASA astronaut Nick Hague and Soyuz Commander Alexey Ovchinin will blast off Oct. 11 at 4:40 a.m. aboard the Soyuz MS-10 crew ship and take a six hour ride to their new home in space. The duo is in Kazakhstan at the Baikonur Cosmodrome launch site making final preparations for their 187 day mission. 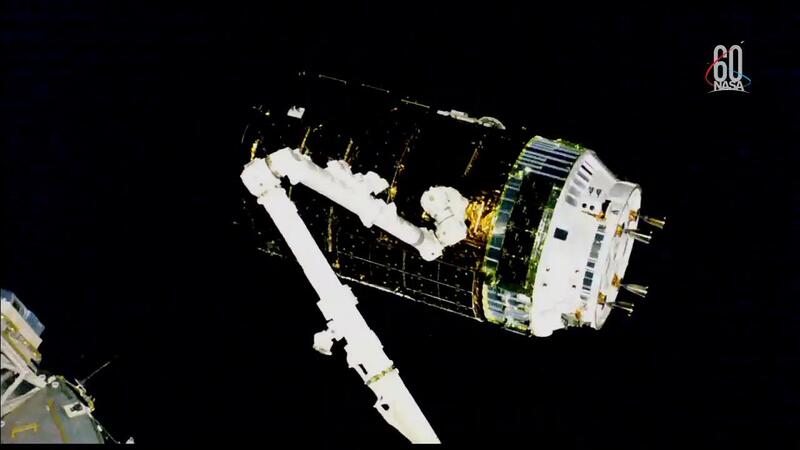 The station is being replenished today as the crew begins offloading cargo from the HTV-7 resupply ship from JAXA (Japan Aerospace Exploration Agency). Robotics controllers will soon unload new lithion-ion batteries packed inside HTV-7 and install them on the truss structure to upgrade the station’s power systems. A pair of spacewalks are planned before the end of the month to complete the battery connections. Sept. 27, 2018: International Space Station Configuration. 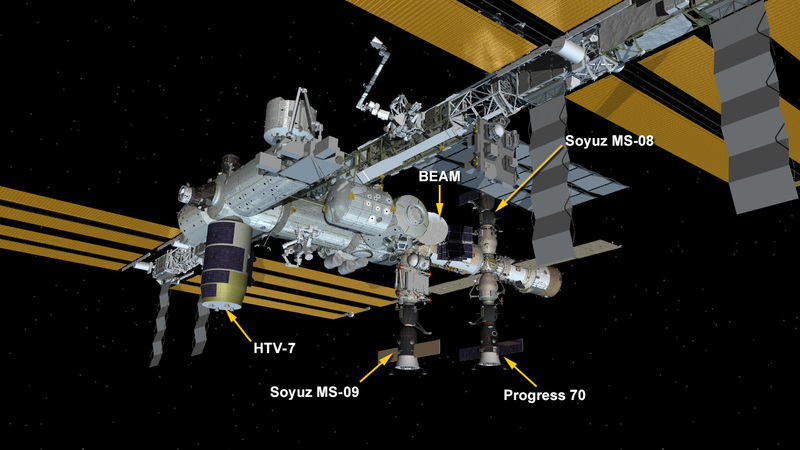 Four spaceships are parked at the space station including the HTV-7 and Progress 70 resupply ships and the Soyuz MS-08 and MS-09 crew ships. Ground controllers successfully installed the Japan Aerospace Exploration Agency (JAXA) Kounotori 7 H-II Transfer Vehicle (HTV-7) to the International Space Station’s Earth-facing port of the Harmony module at 10:09 a.m. EDT. The spacecraft’s arrival supports the crew members’ research off the Earth to benefit the Earth. The cargo spacecraft began its trip on an H-IIB rocket at 1:52 p.m. EDT (2:52 a.m. Japan time) on Saturday, Sat. 22 from the Tanegashima Space Center in southern Japan. The early Thursday morning cargo delivery includes more than five tons of supplies, water, spare parts and experiments for the crew aboard the International Space Station. The spacecraft also is carrying a half dozen new lithium-ion batteries to continue upgrades to the station’s power system. Using the International Space Station’s robotic arm, Canadarm2, Expedition 56 Commander Drew Feustel and Flight Engineer Serena Auñón-Chancellor of NASA grappled the Japan Aerospace Exploration Agency’s Kounotori H-II Transfer Vehicle (HTV-7) at 7:34 a.m. EDT and successfully completed the capture at 7:36 a.m. At the time of capture, the space station and cargo spacecraft were flying 250 miles above the north Pacific Ocean. The Japanese cargo ship, whose name means “white stork,” is loaded with more than five tons of supplies, water, spare parts and experiments for the crew aboard the International Space Station. The spacecraft also is carrying a half dozen new lithium-ion batteries to continue upgrades to the station’s power system. 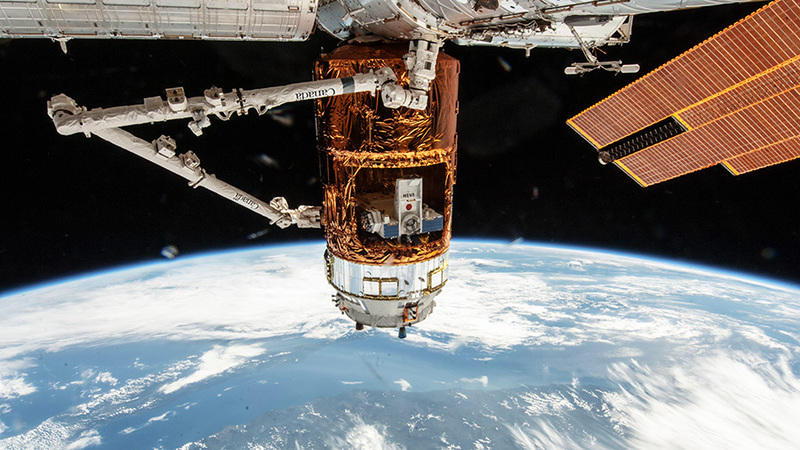 Japan’s third resupply ship, the H-II Transfer Vehicle-3, is pictured in September of 2012 attached to the International Space Station’s Harmony module and in the grips of the Canadarm2 robotic arm. The Japanese Aerospace Exploration Agency (JAXA) cargo spacecraft that launched at 1:52 p.m. EDT Sept. 22 (2:52 a.m. Sept. 23 Japan standard time) from the Tanegashima Space Center in southern Japan is set to arrive at the International Space Station early tomorrow morning. Beginning Thursday at 6:30 a.m., NASA will provide live coverage of the arrival of the unpiloted H-II Transfer Vehicle-7 (HTV-7) via NASA TV and online at http://www.nasa.gov/live. Capture is scheduled around 8 a.m. Coverage of the final installation to Harmony will resume at 10:30 a.m. The HTV-7 is loaded with more than five tons of supplies, water, spare parts and experiments for the crew aboard the orbiting laboratory, including a new glovebox for life sciences investigations. The spacecraft also is carrying a half dozen new lithium-ion batteries to continue upgrades to the station’s power system. Japan’s H-II Transfer Vehicle-7 (HTV-7), also known as the “Kounotori,” is nearing the station and headed for a Thursday morning capture at 8 a.m. EDT. The HTV-7 is loaded with over five tons of science and supplies, including the new Life Sciences Glovebox and a half dozen lithium-ion batteries to upgrade the station’s power systems. NASA TV begins its live coverage of the capture activities Thursday at 6:30 a.m.
NASA astronaut Nick Hague and Soyuz Commander Alexey Ovchinin will launch and arrive one week later. During Expedition 57, the crew will conduct a set of spacewalks to install the new lithium-ion batteries delivered to the station on HTV-7.